The features of ConceptDraw MINDMAP has great value in depicting and describing a problem in detail as quality manager tool. Successful quality management implemented in a company of any size is a critical component of a company’s organization. Effective quality management requires strong formal procedures and a quality culture inside of the organization. Pic.1 Total quality management (TQM) mind map. 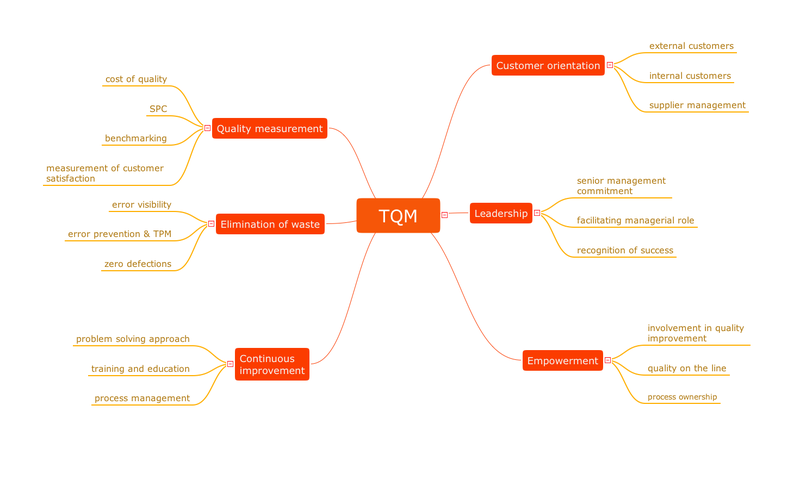 This mind map demonstrates how the well-known Total Quality Management (TQM) methodology can be presented in a mind map. Using mind mapping for quality management is a creative approach that allows one to structure all key quality points on the one page. The visual form of mind maps is helpful in all stages of quality management, from describing problem to describing and documenting a decision. ConceptDraw Quality MindMap solution is a perfect additional tool for the quality team of your organization.